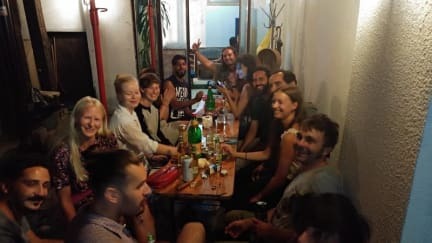 Hostel Ljubicica i Sarajevo, Bosnia og Herzegovina: Bestill nå! Our hostel is located in historical center and old town (Bascarsija), just few meters from main (pigeon) square and tram station. Do you want to spend some awesome time and get to know bosnian people and bosnian hospitality?! Hostel Ljubicica is a great place for you with over 24 years experience! We are offering a wide variety of choices! Do you want to stay in city center and enjoy in peace and at the same time being only 3-10 minutes walking from main tourist and historical attraction? Look no further this is the place for you! For our guest we also have big common room where you can organize parties, watch cable TV , check you e-mail or maybe socialize with other tourists and use kitchen. Our hostel is located in the heart of old Bascarsija square. All around us you can enjoy best coffee bars, shops, night clubs and restaurants with delicious Bosnian food. Our staff will give you all information that you need, free maps and magazines about Sarajevo. -From main bus station and railway station, take tram number 1 and take off at 8th stop “Bascarsija” and just 5 meters on the right side you will see our reception. - If you come from bus station in East Sarajevo “Lukavica”, you can take public bus 31e (Vijecnica-Dobrinja). When you take off keep walking straight and after 150 meters you will see our reception. We are offering tours & excursions with tourist guide ! -Taxi service to Belgrade for only 25€! -Always available beds even without reservation. -Bus and train time table to all directions. Please note: Tourist tax and insurance is NOT INCLUDED in price. It's paid at the desk.